Enter to be November's Soldier of the Month here! Whether you’ve been on a Backstreet Boys cruise, a Las Vegas residency show, or a Nick Carter solo event, you have probably seen the October 2017 Soldier of the Month there. 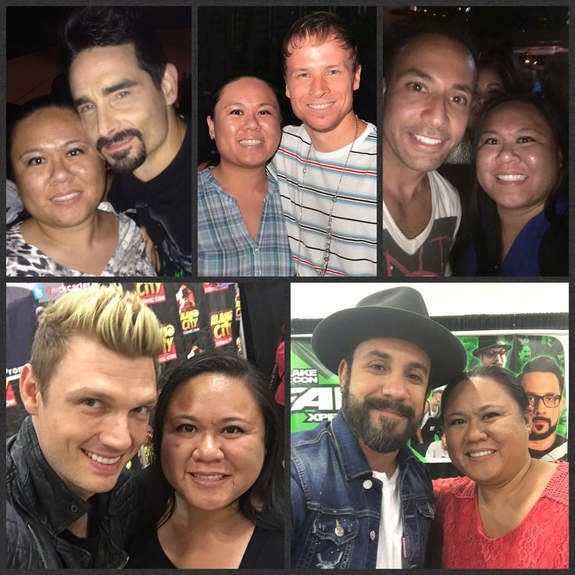 Jocelyn Bringas has been around the Backstreet Boys online fandom since there was one and showcased that in her video admission to be the Soldier of the Month: watch it here. Bringas has seen multiple shows since the “Into The Millennium” tour and saw 16 shows on the first run of the Backstreet Boys Las Vegas residency. She’s seen Nick in concert on his solo tours over 30 times and since she lives in Bay area of California, has gotten to see multiple television appearance tapings. The published author who works in the television industry was first captivated by AJ McLean’s voice on “Quit Playing Games (With My Heart)” and received their first U.S. album for her 12th birthday. After that, she was a goner. Now get to know your October 2017 Soldier of the Month a little better by meeting Jocelyn Bringas. Where are you from? The Bay Area in California. What do you do for a living? (job, etc.) I'm a Community Access Facilitator for CreaTV San Jose. It's a non-profit media center which provides local residents low-cost production facilities, equipment, and training needed to create non-commercial content to be broadcast across our four channels. How long have you been a BSB fan? I've been a fan for over 20 years. How did you become a fan? Back in 1997 I used to listen to the radio a lot. Many of the stations I listened to would play "Quit Playin' Games." Initially, I didn't give the song a chance. I remember when I heard the first few seconds of it, before anyone sang, I'd actually get up and change the station. One evening I had the radio on and the song started to play for what seemed like the millionth time. I was too lazy to get up and change the station. I let the song play out in its entirety as I waited for the next song. It was when I heard the guy (who I later learned was named AJ McLean) sing "baby, baby the love that we had was so strong ..." that I realized the song wasn't so bad. After that realization, I didn't ever change the station again whenever that song played. Then for my 12th birthday on October 5th, 1997, I made a long list of CDs I wanted my parents to buy me. Once we got to the store and I saw the prices of each CD, I decided I didn't want my parents to spend too much money on CDs. I chose my top 2 which were Backstreet Boys' US debut album and Madonna's Something to Remember. After listening to all of the songs on Backstreet Boys' CD I was captivated by their voices and harmonies. At that point in my life, I had never heard anything so beautiful. They were unlike anything I've heard before. It was refreshing to my ears. What is your favorite BSB memory? There have been so many memories. I can't pick one. 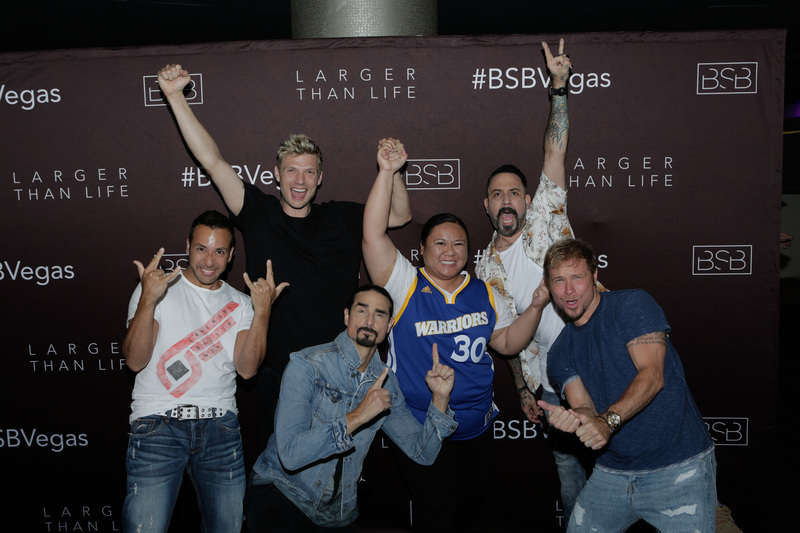 I used to not like asking Bsb to do a pose in my VIP pictures because I was paranoid not all of them would get the memo. For my Vegas Residency meet and greets I decided to be bolder. I've had my best group pictures with them this year in Vegas. I love that they're down to do a pose as long as it's explained clearly to them. One of my favorite poses I did with them involved the second book I wrote entitled "Heartthrob Daddy." I remember AJ asking me if my book was another naughty one and I told him it was. 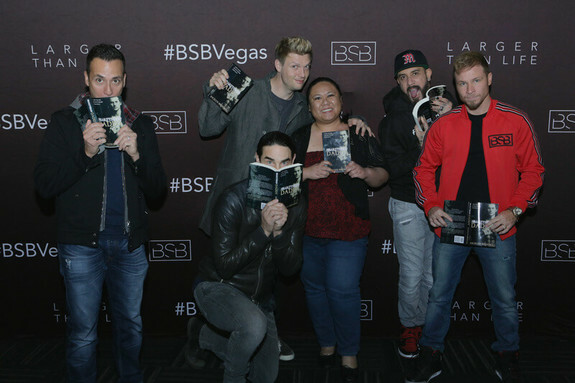 I had previously taken a picture with O-Town with my first book "Heartthrob Fantasy" and they all posed with differing reactions to it. I wanted Bsb to top O-Town's pose and I think they did a good job. What is your favorite BSB song and why? My go-to favorite is "Unmistakable" from the Unbreakable album. I love the concept of the song and how out there in the world is a person we could fall in love with but we don't know who they are yet. However, I feel like I have to pick another song that has Kevin in it and was released as a single, so I pick "I Still" as my other favorite. I believe most of the lyrics can apply to how I feel about being a Bsb fan. What is your favorite BSB video and why? Everybody (Backstreet's Back) is my favorite Bsb video. It has great production value. There's a storyline that intertwines beautifully with each of their characters. I love its Halloween vibe along with the elaborate costumes and makeup. Most of all I love the dance scenes that features their signature moves. Who is your favorite Backstreet Boy and why? Nick is my favorite. He became my favorite in 1999 when I noticed his voice had matured on the Millennium album. I remember watching the "I Want It That Way" music video for the first time and noticing how attractive he had become. He no longer looked and sounded like a scrawny teenager. He had grown into what I jokingly refer to as a berry *delicious* man. Also, in 1999 I began reading fan fiction. I found myself gravitating toward reading Nick centered stories. Eventually, I delved into writing my own stories and discovered that Nick was my muse. There's something about him that gets my creative juices flowing. He actually inspired the first two books I wrote, "Heartthrob Fantasy" and "Heartthrob Daddy." Also, a picture he posted of him wearing all white in 2013 on Instagram pushed me to write a short story entitled "Taste" featured in "Best Women's Erotica of the Year, Volume 2." I've watched him grow up and witnessed from the sidelines the different phases he went through. What I love about him is his tenacity to follow through with his goals and projects. I wish I could have half of the drive he has. How has BSB impacted your life? Their music has definitely lifted me up whenever I was feeling down. The energy they put out during each performance is what keeps me coming back. I've connected with so many awesome people through their music. Most of my closest friends I've met because of them. In 2005, I remember getting my first job at Great America, a local theme park, so I could save money to go to multiple shows on the Never Gone tour. They keep me motivated to work hard so I can earn money to see them. Being a fan has also made me a better traveler. I've been fortunate enough to have seen them in multiple cities across the US and different countries. What is your favorite thing about being a BSB fan? My favorite thing about being a BSB fan is their love and appreciation for their fans. I love that they are still together after so many years and that they still have the desire to create music and perform at concerts. I know you've been to Vegas. How many times have you seen the show there? I've been to 16 shows of the first run of the 2017 Vegas residency. I plan on seeing 7 for the second run. Do you know how many times you've seen the guys in general? Or an estimate? This question got me curious about how many times I've actually seen Bsb both as a group and solo. I couldn't resist counting and breaking it down by category. Below is a rough estimate of what I've been to. I know you've been to a lot of tapings, what has been your favorite taping that you've attended? My favorite taping I've attended was the "Undateable" series finale which was broadcast live on the east coast on 1/29/16. Since it was the last taping of the season there was a limited amount of people from the general public let into the taping due to the cast and crew inviting their friends and family. I was one of the lucky few that got in. I have a degree in Radio/Television/Film from San Jose State University so I enjoyed getting a behind the scenes glimpse of the show's production. After the taping, the "Undateable" crew handed out copies of the script which most of the cast members stayed behind to sign. As I exited the studio I was able to get a picture with AJ and Nick and chat with them for a brief moment. They also signed the script I got.